I've never played Injustice or Injustice 2. I know, how can I call myself a DC fan? Hey, there's only so many hours in the day. But I've seen both games, and I've certainly seen the various collectible incarnations. The designs of various characters are interesting, and the ability to customize things makes it all the more unique. We've seen figures from Tamashii Nations, and even Mattel hit them up with their DC Comics Unlimited series a few years ago. But Hiya Toys has the license now, and their going all in with a bunch of characters already available for pre-order. These are Injustice 2 based, working off the latest version of the game. The first two to ship are Batman and Superman. Seems right, no? These guys will run you around $20, and both are a Previews exclusive, which pretty much just means you'll find them at your local or online comic shop rather than a mass market retailer. These guys are 1/18 scale, so they could have gone with a carded design. But instead we got a box, and I love boxes for their collector friendly nature. The big window shows off the figure and the accessories, and you can slip everything out and put it back with little damage to the package. As I said, these are 1/18 scale, and both come in at about 4 1/4" tall. The detail work on the costumes is particularly nice considering the size, and they've engineered the articulation to co-exist with the sculpt. Batman is my preference of the two, although I doubt that comes as a surprise. The portrait is basic, with a stern but non-committed expression. The armored pieces look good, and there's a little variety in the texture. The cape is cloth, a smart choice in this scale, and it hangs cleanly off his shoulders and down his back. Superman actually has two portraits. One is a standard head, while the second has an open mouth and white eyes. 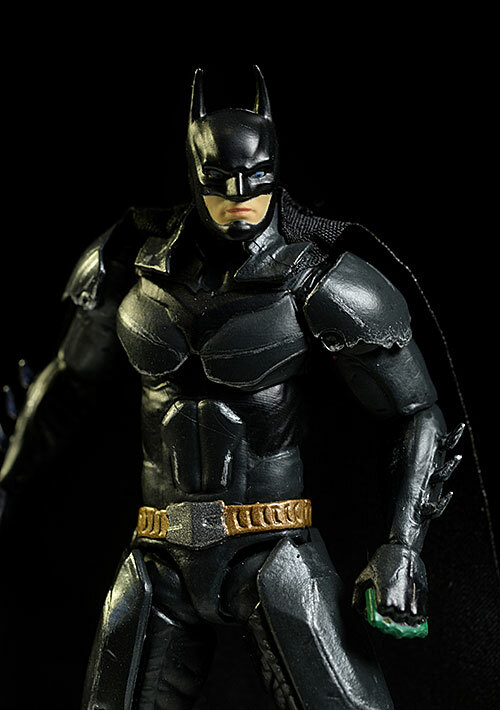 The detail is good on the standard version, but I'm not loving the smooth teeth on the secondary head. 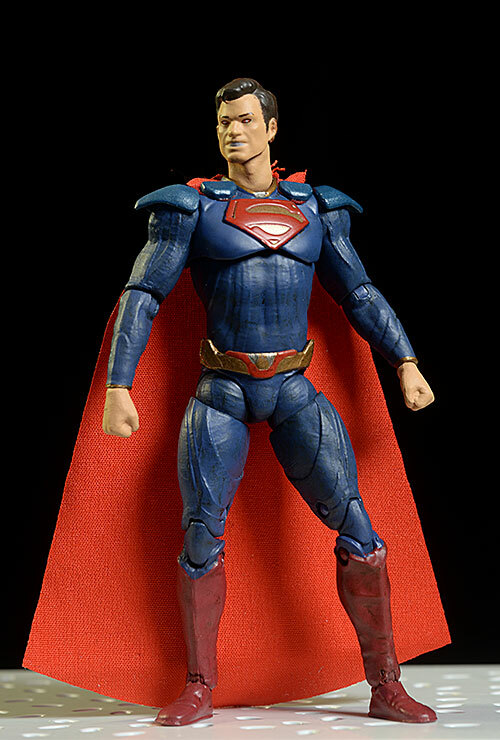 He also has some varying textures on the costume, and the cloth cape looks terrific in just about any pose. The paint operations are good on the costumes, but there are some issues on the faces, particularly Superman. 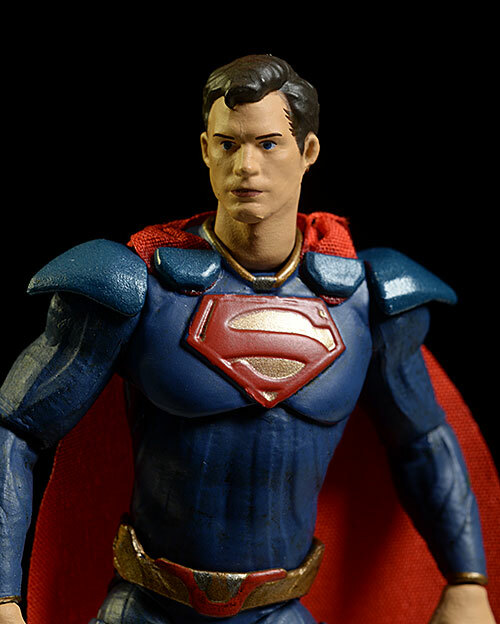 There's not a ton of detail, but the chest symbol on Supes is clean and sharp, and the tricky gold, silver, and red colors on the belts are surprisingly well done. 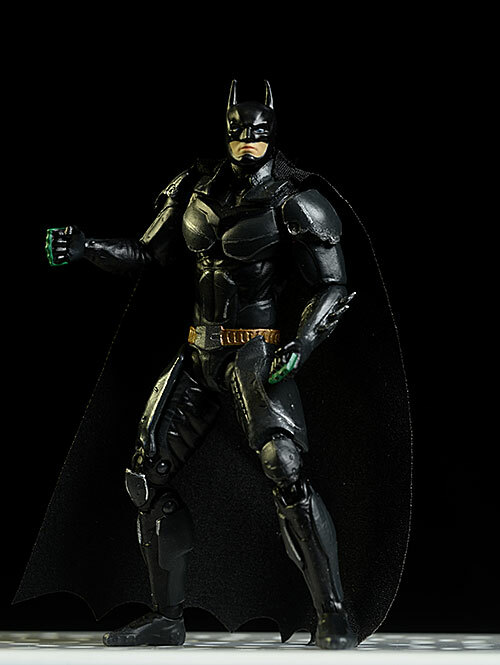 Batman even has some brass knuckles (I assume these are specific to beating a particular character in the game?) and the detail paint work on them is quite good. 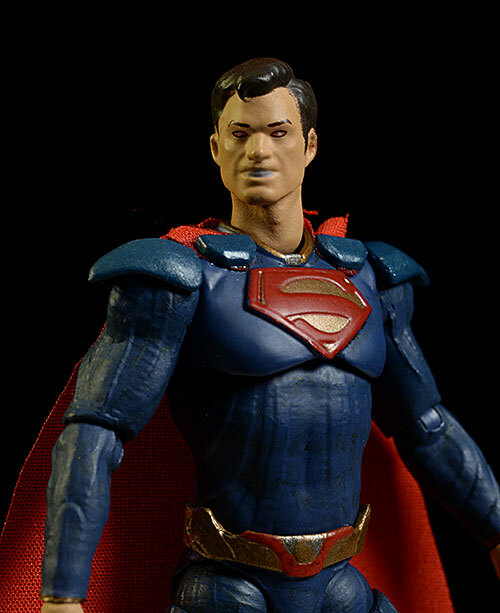 Superman's regular portrait has some dirt in the skin tone though, and the smiling portrait has that goofy, flat smile, exacerbated by the thicker white paint job. Both figures have a ton of well designed articulation that allows for great posing and play. There's a ball jointed neck of course, and I was able to get a ton of tilt and lean movement out of it. The rotating hinge shoulders and elbows give him reasonable arm movement, but the ball wrists are really just cut joints. I wish they had a little more mobility, and it would have gone a long way to further improving the look of any stance. The torso can tilt, lean, and turn at the chest, and the rotating hinge hips, double pin knees, and terrific hinge/rocker ankles allow for just about any leg pose. 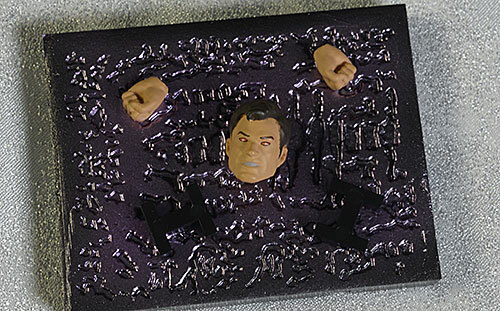 The joints were generally tight too, and they are able to maintain poses long term with or without the display base. The hands swap easily, but do tend to pop off when you're working with them. It's not because they are super loose, but rather because you'll want to get more movement out of them then they can give. Back in the day, Mattel did an Injustice Batman and Joker in a larger scale. And you got nothing with them. Getting several accessories in this tiny scale is always a big plus. Both come with extra hands. 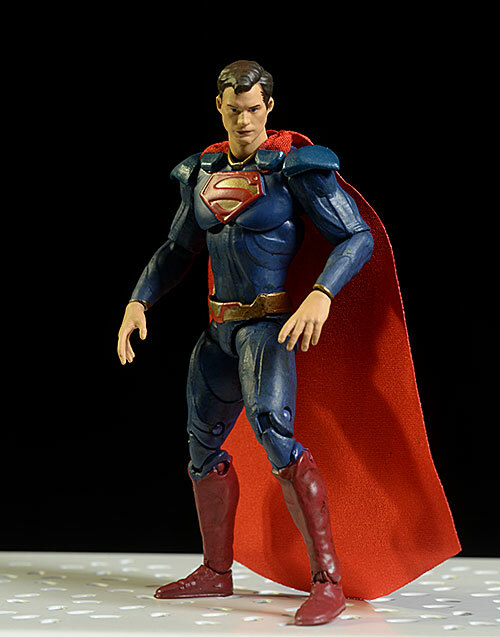 Superman has two open hands, as well as two fists. 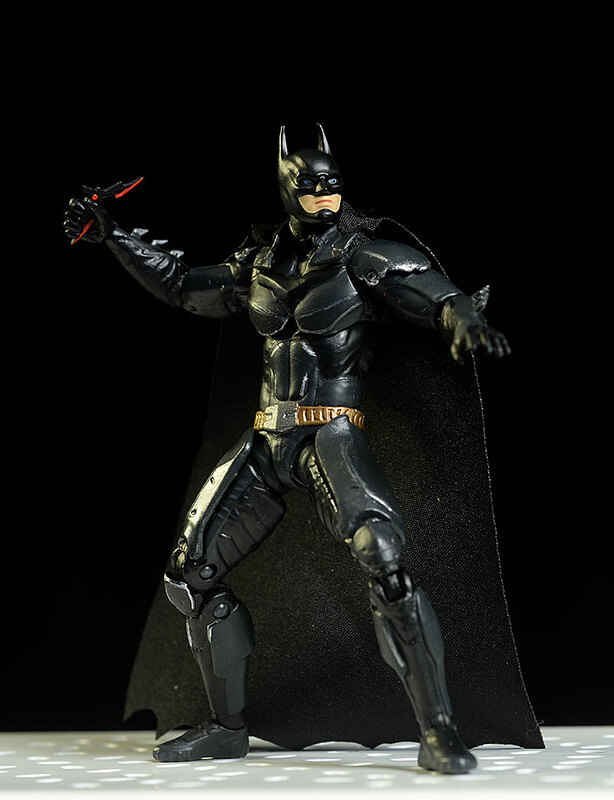 Batman has two fists, as well as a gripping left and right hand for the grappling gun, an open left, and a gripping right for a batarang. 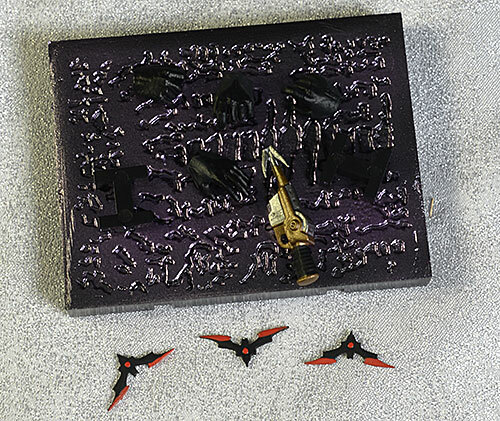 Both also come with small, sculpted display stands. There's a single foot peg, and while these aren't necessary, they are a nice addition. Tiny figures like this, even when well designed, tend to fall over at the slightest bump. These stands can also be attached to one another with black clips. 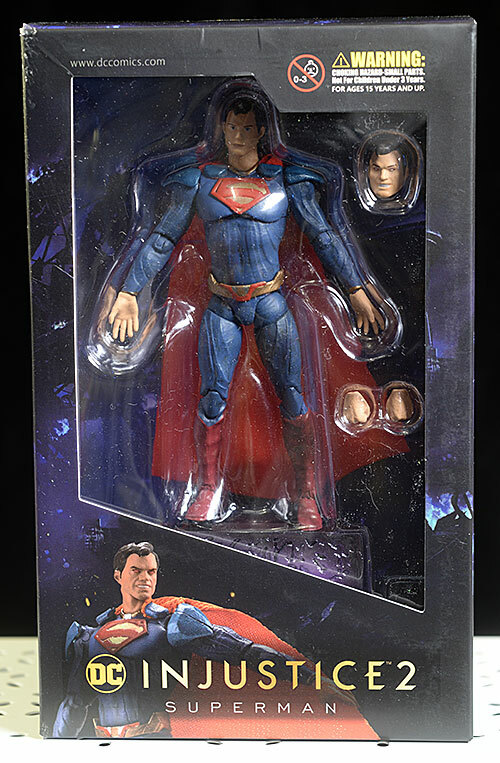 Unique to Superman is his extra head, which I already mentioned. Swapping shouldn't be hard, but if you're an idiot you can run in to trouble. More on that in the Things to Watch Out For section. 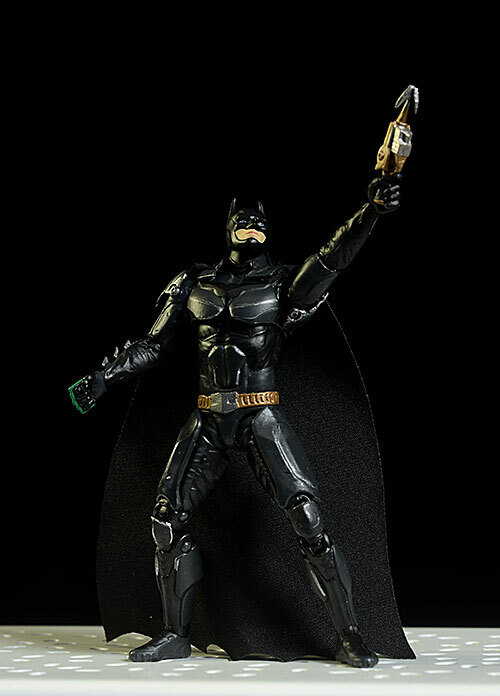 Batman has his own unique accessories too - a grappling gun and three batarangs. These are based on game designs of course, and fit neatly in the provided hands. The grapple hook on the end of the gun is removable too. These are great toys, with solid articulation and plenty of play value. Unlike a lot of import 'collectibles', they are also reasonably priced when compared with many mass market items of similar size and style in the U.S.
Yep, at $20 each, these are only a few bucks more than the old DC Comics Unlimited were back in 2013. Of course those were 6" figures and these are 4", but those were also mass market releases from a huge company like Mattel, available on the pegs of your local Target. These are imports, with a nice assortment of extras, and terrific articulation. A warning to those that come after me - don't follow in my footsteps. 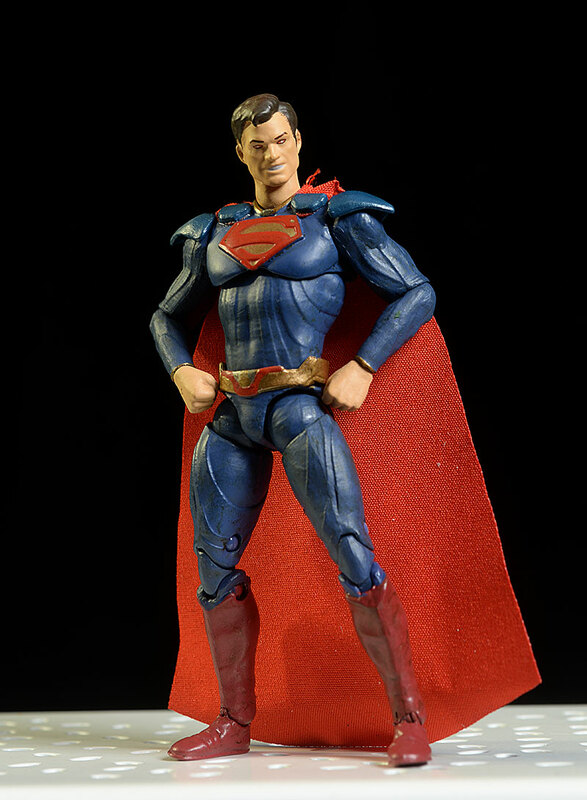 When swapping the Superman head, I popped off the original only to find the neck post popped off with it. No problem, I figured I'd just pop it out of the head with my handy needle nose pliers. I grabbed the thin post tight, and steadily applied ever increasing pressure. Of course, it worked like a charm, and the neck post popped out of the head. This post was being squeezed tightly in the very tip of a pair of pliers though, and as anyone with any common sense would have realized, the second it was free of the head it shot out of those pliers like a bullet. I have no idea where it's at, although I suspect I will come across it in 20 or 30 years, and wonder to myself "what the Hell is this?" So yea, don't do that. Or at least, do it with your hands inside a box, or under a towel. Sometimes my only purpose is to serve as a cautionary tale, and I accept that. Hiya is going all in with this series, and have a ton of additional figures up for pre-order, including the Joker, Harley, Flash, Wonder Woman, Red Hood, Supergirl, Swamp Thing...I think I'm forgetting a couple more. It's nice to see the quality in the articulation, and the extras that make these worthwhile. They're pushing the bar with 1/18 scale figures, and while I still have my nits, these are a solid purchase for fans of the game. - has them for $20 each, along with the many others coming soon. - Entertainment Earth also has them at $20 each. Mattel did some Injustice figures in a slightly larger scale back in the day, including a Batman and a Joker. Hiya has also done some great 1/18 scale Predators, Aliens, and Colonial Marines.